Man. Just read through your thread. You have had more issues than I could bare and you still just keep persevering like a boss. But then it dies again... Damn. How you keep blowing head gaskets is unbelievable. First step I would do is get that lower belt cover and set that crank in the correct position and can timing. Right now you’re blind times. Could be causing more issues than you like. Even the idle/stalling coming to a stop. Where are we standing now? Details. PM me your address. I’ll send you some orange body injectors on me. I have dozens. Actually, the first time I replaced my headgasket I diagnosed it wrong. The second time it was definitely blown. I think I got the timing to -10 at idle, but I'm not sure I got it right. I managed to mostly eliminate the issue with it stalling when coming to a stop, but obviously it's back now that it only has 3 cylinders. Luckily, I have my other 240 and a family backup car (RAV4) so this car constantly breaking down isn't that much of an issue. I just gotta get around to rebuilding the engine that originally came with this car. And get a WB. I will take you up on those injectors. PM incoming. What FPR are you using? stock 240 one? I should stop assuming things. I was planning on buying a WB about now since I just bought an Ostrich from another user. I did have one, but it wouldn't work right and had to return it. My advice is to take the fuel pressure regulator off and check that it is indeed a 3 bar. I never assume people do things right unless I'm watching or doing it myself. pull the 3 bolts and take the fpr off and check the part numbers. Some will say 3bar or 2.5 bar others will just have part numbers stamped in. Use that to figure out which one you have on there. 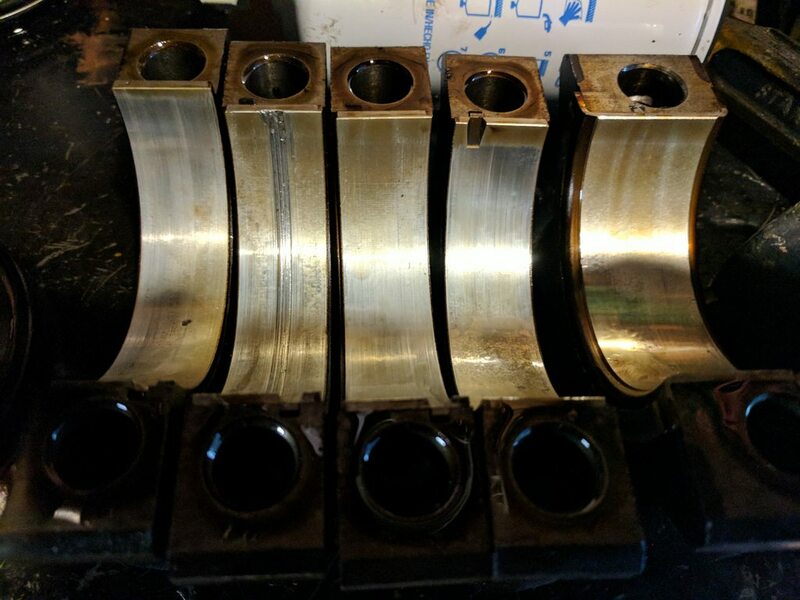 All bearing surfaces and bores look fine to me, which I'm very happy about. Gave it a few coats of engine paint. Hopefully, if I work fast, I can do this before it gets really cold. Obviously this time I'll be replacing the injectors and getting a WB. I also had to replace my carrier bearing recently, made a nice racket when it let go. 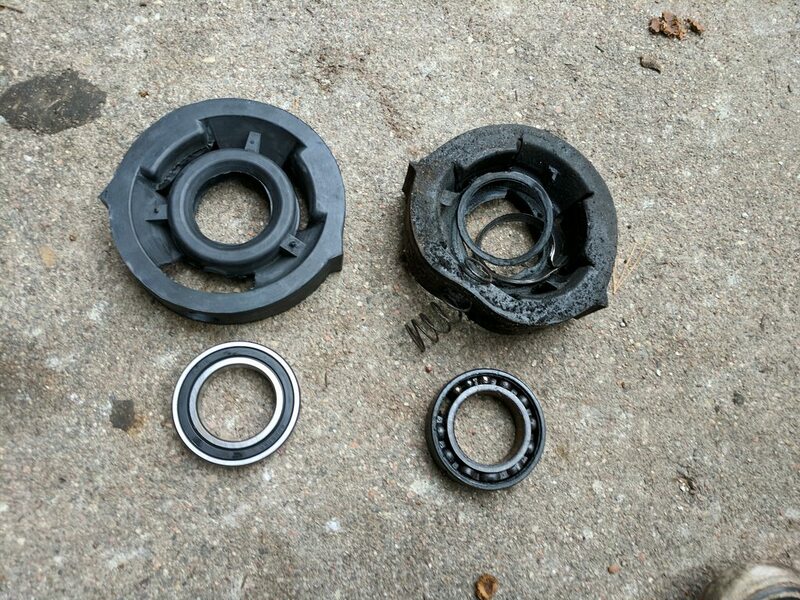 That second bearing from the left doesn't look so healthy...? Oh, forgot to mention that. Crank jounal seems fine, can't feel anything with my fingernail. Must've been a piece of aluminum or something soft. Wife keeps forgetting to ship your injectors. They are sitting there. I’ll try and get them out tomorrow. Are you getting your crank polished ? I wouldn't trust a fingernail test to confirm that a crank is not damaged from that bearing. 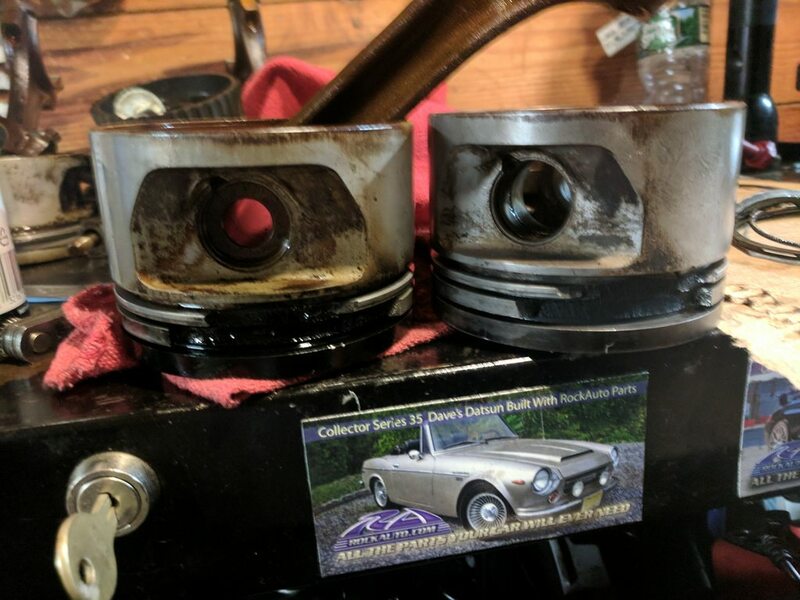 New piston doesn't fit. It's about 1mm out of round at the bottom of the skirt. EDIT: I'm an idiot. Bought an oversize piston. Last edited by Cwazywazy; 11-09-2017 at 05:26 PM..
Now's your chance to drop some B230ft pistons in there. But lower compression means more slow? And less blow uppy, I suppose.. I would just grab a couple from the engine currently in the car, but it has a ton of piston slap so I dunno. 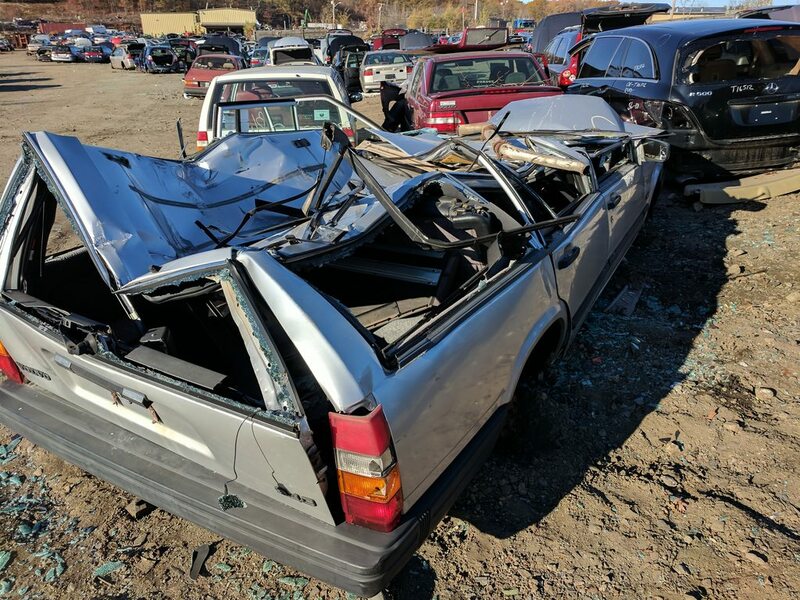 There's a turbo 7 series at the junkyard I plan on grabbing the T3 from tomorrow. No shaft play. Dunno why it's there though, no crash damage. No lower compression means moar boosties and much fasts. I like the sound of that. I'll give you $14.99 for a set. Pluck them out of that 740 in your JY, or run up the road to FCP scrotum and lay your money down. 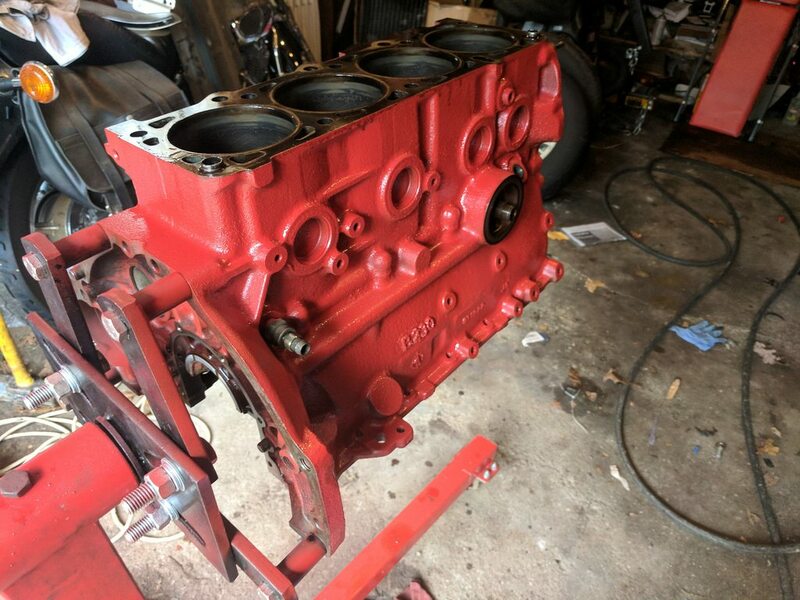 I'm tempted to just take the whole engine, only $80 more than 4 pistons. But I'm skeptical because the car has no accident damage so who knows..
Poopy transmission / metal in the pan? Rusted out / blown out interior? Any paperwork in the car that might provide a clue as to the downfall ? I'll have to do some investigation. This isn't a very good yard, they just plop the cars on the dirt without wheels. Decent haul today. No turbo, couldn't get the bottom exhaust nut, couldn't find a sawzall, and I wasn't about to wait for the guy in the loader to pick the car out of the corner of the yard just for the turbo. Still though, I got a 960 fan, turbo FPR, 5 Virgos, etc. And I saw this mint 940, someone should buy it. Sam's u pull it, way up in Worcester. I was up there buying the Virgos anyway.